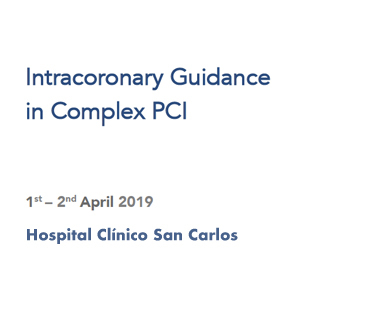 Welcome to the Intracoronary Guidance in Complex PCI Course. We have been running physiology and imaging courses for over 6 years and in that tiem have seen the field change as the influence of technology makes a greater and greater impact. Recently, the development of iFR and co-registration for both physiology and imaging, the field has continued to evolve at a faster pace to move intracoronary guidance techniques to not just act as gatekeepers to treatment, but, also to be important tools for guidance of treatment. These importante toos continue to evolve and improve revascularization treatment and decision-making in an ever-aging patient population with increasing complex coronary artery disease. This was perhaps most elegantly demonstrated recently in Syntax 2. This trial showed that by implementing best practice in intracoronary guidance, with modern drug eluting stents and medican therapy that it was posible to significantly improve clinical outcomes in patients with complex multi-vessed disease. Over the next two days we will cover all of the key development steps and dara to supprt the use of these lastest clinical techniques. You will see that we are privileged to have a distinguished faculty; all of whom are engaged in cutting-edge research in the field of intravascular imaging and coronary physiology in addition to beign expert PCI operators. Fechas: 1 y 2 de abril de 2019.